Before he was Captain “Fearless” Phil, Phillip Adams was just another young boy grateful for the privilege to have been born to a family of fishermen in Panama City Beach. He spent his youth on the water, just as his father and grandfather had. After World War II, his family got into SCUBA diving before anyone was doing it on the Gulf Coast. As each generation went by, one man took on the role of provider, diving and fishing to feed the family. Phillip’s mother worked at the bank, and his father was the postman. “All that free fish helped,” he says. Phillip had an uncle who had been to Vietnam, returning home after being shot down. “I always followed him around, wanted to learn from him … be like him,” he recalls. On his 18th birthday, Phillip took his captain’s test with the Coast Guard. He began taking out charter boats of fishers and divers. Then, in 1978, he joined AMI Kids, working with delinquent children on the ocean. It became his career for 25 years, and he enjoyed every minute of it. But when he was ready to retire, he wanted to stay on the ocean. That same beloved uncle, Andy, had brought a pirate ship attraction to Panama City Beach. His replica boat had been operating for five years. Phillip thought he could learn the business from Uncle Andy, then build his own boat in another harbor. But during the first month of working together, good ol’ Uncle Andy made Phillip an offer he couldn’t refuse. Eleven years later, the Sea Dragon is going strong. 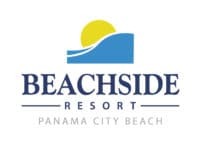 Building on his uncle’s solid foundation, the Adams family has created a truly magical experience in Panama City Beach. His wife runs the ticket booth, while he mans the ship. Even daughter Summer “Breeze” gets in on the action, stepping into character as a galley wench, serving food and beverages on the ship. There’s lively music, water gun fights, face painting, limbo and dance parties … even a treasure map leading to ‘sunken treasure.’ There are also ample opportunities to observe local wildlife, like birds, fish and bottle-nose dolphins. The entire crew has a genuine love for the ocean, and their passion shines through on several two-hour cruises each day, the most popular being the sunset sail. Skip the lines and buy your tickets online, as many cruises sell out in advance. The Sea Dragon’s sailing season is from March to October. It gets quite hot in the summer, so Phillip advises taking a sunset cruise in June and July. Guests aboard this pirate cruise can expect great value and excellent service. There’s no price gouging here. Bottled water is just a dollar, versus the two or three you might find at other area attractions. If it rains, you won’t lose your money. Well, would you look at that? A pirate with heart! Cruise into the sunset with Captain “Fearless” Phil and his crew from the Lighthouse Marina at 5325 North Lagoon Drive in Panama City Beach, FL 32408. 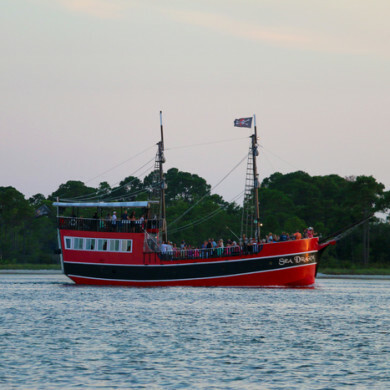 Learn more about the Sea Dragon website or call (850) 234-7400.